The CAME-PRODIGY gimbal is physically the largest of our gimbal family and is a great platform for larger cameras and lenses. The new Prodigy is running the latest 32 bit Controller with Encoder Technology for enhanced stability and battery efficiency. All motors rotate a full 360 degrees without limitation for greater range and flexibility during operation. Featuring a quick release camera plate along with tool-less adjustments for easy and fast camera balancing. Included are a wireless remote control which allows you to control the gimbal from a distance and a storage/balancing stand. Everything fits into the included hard case. On the top section there are two handles that are easily hand screwed for installation or removal. On the handle there is a wireless remote which allows you to remotely control the gimbal and switch between modes. 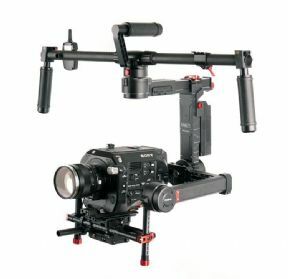 The entire top handle bar can be easily separated from the gimbal which than can be mounted to other devices like a crane, slider or drone with the optional adapter plate. On the middle section there is a quick release battery system that uses 18650 rechargeable batteries. Included is a battery charger that has both AC and a car adapter to charge your batteries on the go. On the bottom there is a video transmitter along with a D-Tap out which you can power an accessory like a wireless follow focus. There is a 15mm rod mount on which you can mount an accessory such as a wireless follow focus.